The premise of your government is based on the principles of utilitarian perspective. In my view, politicians and their “economists” don’t decipher that “it is immoral to use another person merely as a means to an end, and that people must, under all circumstances, be treated as ends in themselves”. This is possible, when rational liberty is unhindered. 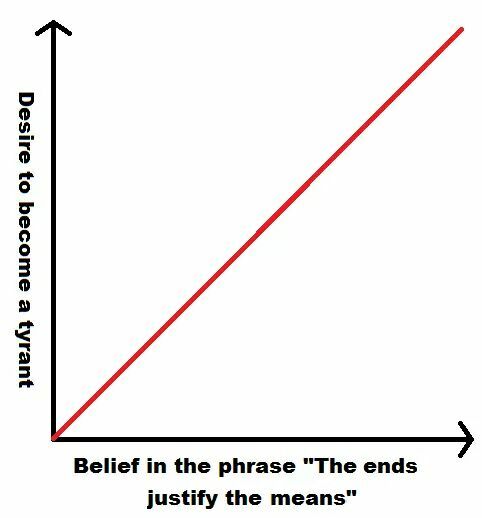 The term “the ends justify the means” is one succinct way of saying that the methods use to attain a goal are justified by the goal itself. This belief is responsible for the global chaos, today. This organized chaos is perilous than dangerous freedom, since it is a political foundation of the imbeciles. Reasoning with the proponents of “greater good” theory is like playing chess with a pigeon. The result sought by an action is called its end, goal, or aim. One uses these terms in ordinary speech also to signify intermediate ends, goals, or aims; these are points which acting man wants to attain only because he believes that he will reach his ultimate end, goal, or aim in passing beyond them. Strictly speaking the end, goal, or aim of any action is always the relief from a felt uneasiness. A means is what serves to the attainment of any end, goal, or aim. Means are not in the given universe; in this universe there exist only things. A thing becomes a means when human reason plans to employ it for the attainment of some end and human action really employs it for this purpose. Thinking man sees the serviceableness of things, i.e., their ability to minister to his ends, and acting man makes them means. It is of primary importance to realize that parts of the external world become means only through the operation of the human mind and its offshoot, human action. External objects are as such only phenomena of the physical universe and the subject matter of the natural sciences. It is human meaning and action which transform them into means. Praxeology does not deal with the external world, but with man’s conduct with regard to it. Praxeological reality is not the physical universe, but man’s conscious reaction to the given state of this universe. Economics is not about things and tangible material objects; it is about men, their meanings and actions. Goods, commodities, and wealth and all the other notions of conduct are not elements of nature; they are elements of human meaning and conduct. He who wants to deal with them must not look at the external world; he must search for them in the meaning of acting men. Praxeology and economics do not deal with human meaning and action as they should be or would be if all men were inspired by an absolutely valid philosophy and equipped with a perfect knowledge of technology. For such notions as absolute validity and omniscience there is no room in the frame of a science whose subject matter is erring man. An end is everything which men aim at. A means is everything which acting men consider as such. It is customary to say that acting man has a scale of wants or values in his mind when he arranges his actions. On the basis of such a scale he satisfies what is of higher value, i.e., his more urgent wants, and leaves unsatisfied what is of lower value, i.e., what is a less urgent want. There is no objection to such a presentation of the state of affairs. However, one must not forget that the scale of values or wants manifests itself only in the reality of action. These scales have no independent existence apart from the actual behavior of individuals. The only source from which our knowledge concerning these scales is derived is the observation of a man’s actions. Every action is always in perfect agreement with the scale of values or wants because these scales are nothing but an instrument for the interpretation of a man’s acting. Ethical doctrines are intent upon establishing scales of value according to which man should act but does not necessarily always act. They claim for themselves the vocation of telling right from wrong and of advising man concerning what he should aim at as the supreme good. They are normative disciplines aiming at the cognition of what ought to be. They are not neutral with regard to facts; they judge them from the point of view of freely adopted standards. This is not the attitude of praxeology and economics. They are fully aware of the fact that the ultimate ends of human action are not open to examination from any absolute standard. Ultimate ends are ultimately given, they are purely subjective, they differ with various people and with the same people at various moments in their lives. Praxeology and economics deal with the means for the attainment of ends chosen by the acting individuals. They do not express any opinion with regard to such problems as whether or not sybaritism is better than asceticism. They apply to the means only one yardstick, viz., whether or not they are suitable to attain the ends at which the acting individuals aim. Action is an attempt to substitute a more satisfactory state of affairs for a less satisfactory one. We call such a willfully induced alteration an exchange. A less desirable condition is bartered for a more desirable. What gratifies less is abandoned in order to attain something that pleases more. That which is abandoned is called the price paid for the attainment of the end sought. The value of the price paid is called costs. Costs are equal to the value attached to the satisfaction which one must forego in order to attain the end aimed at. Physiology and psychology have developed various methods by means of which they pretend to have attained a substitute for the unfeasible measurement of intensive magnitudes. There is no need for economics to enter into an examination of these rather questionable makeshifts. Their supporters themselves realize that they are not applicable to value judgments. But even if they were, they would not have any bearing on economic problems. For economics deals with action as such, and not with the psychical facts that result in definite actions.